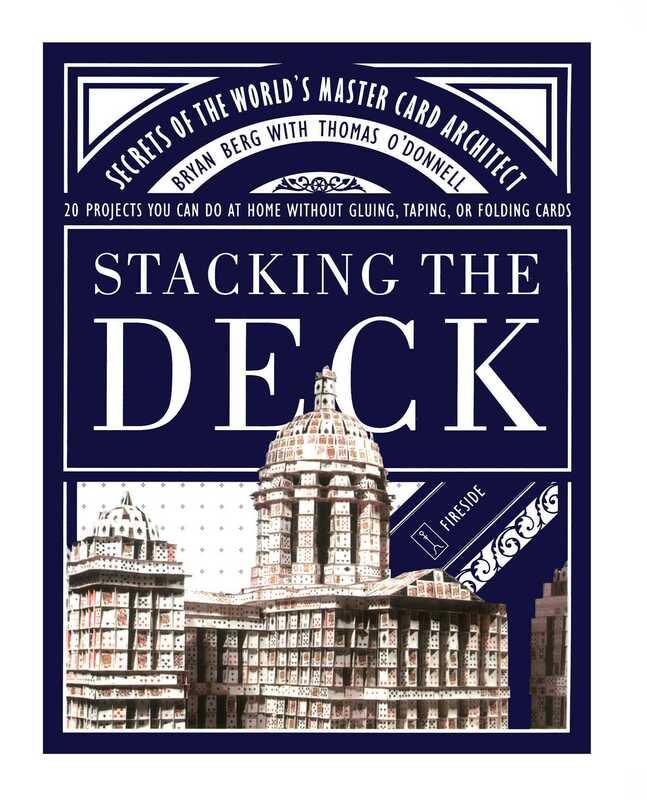 Written by the holder of several Guinness World Records for cardstacking, this is the first complete, fully illustrated guide to the art of building mind-boggling, multilevel structures with ordinary playing cards. In Stacking the Deck, Bryan Berg reveals the secret to successful cardstacking with his simple four-card-cell structure and expanded grid techniques. Using illustrations and step-by-step instructions, he guides readers on to more elaborate -- and incredibly strong -- creations. He covers a wide range of architectural styles, from classic to whimsical, and various types of structures, including pyramids, shrines, stadiums, churches, an oil derrick, and even the Empire State Building. Since first setting the height record in 1992, Bryan's built awe-inspiring card models of a Japanese shrine, the Iowa State Capitol building, Ebbets Field, and his latest tower, which is more than twenty-five feet tall! This book includes photographs of some of these amazing pieces, illustrating just how appealing and enduring a "house of cards" can be. Stacking the Deck will inspire everyone from youngsters experimenting with their first deck of cards to adults, who can create their own private skyscrapers. Once you've read Stacking the Deck, you'll never look at a deck of cards the same way again. People often use the phrase "house of cards" to describe something shaky and unstable. They haven't seen what I've been building with cards for eighteen years -- miniature versions of stadiums, landmarks, and futuristic cities. I've set six Guinness World Records for the tallest freestanding house of playing cards. Everything was built without folding, taping, gluing, notching, or otherwise joining any cards. Even so, my creations are incredibly strong. One of my structures supported 2,700 pounds of Las Vegas showgirls. Another held an entire Little League team -- complete with coaches. It sounds impossible, but as you read this book you'll see it can be done. This book will teach you to make strong, tall buildings that are also beautiful and, at times, whimsical. You'll become accomplished at techniques you never dreamed of. Or perhaps you'd rather just look over the stories and photos about the unbelievable things I've built. I'll soon show you how easy card stacking can be. Before you build, though, get the right cards and the right location. • The best cards for building have standard thickness, standard size, and less than standard finish. Buy decks with a matte finish -- not a slick, glossy coating. The cheapest playing cards often are the best for building. Look for decks wrapped in cellophane. I use Pla-Mor brand from United States Playing Card Company, but any inexpensive, uncoated cards will do. Make sure they're flat, and toss any bent or wrinkled cards. The photo shows some of the Pla-Mor styles. The designs may vary, and Pla-Mors may not be available in your area. If you have difficulty finding them, visit www.cardstacker.com to email me, or write me at the address at the end of this book. • Business cards, index cards, or recipe cards will work instead of playing cards. I like regular playing cards, though, because it doesn't seem real without diamonds, hearts, clubs, and spades. When I first did this crazy hobby for money, I built towers with the backs facing out. I started putting the suits facing out because people kept asking me what they were. • While old decks often have great surfaces, they're usually too beat up and bent or inconsistent to be useful. • If you use multiple decks, don't even think of building with different-size cards. All the decks must be of consistent size and quality. • Avoid sports cards. Their paper is too thick, and their finish is too glossy. The sports cards I've used usually were specially made for building. Choose your card-building surface carefully. It should be textured, like short carpet or a piece of particleboard. You could build on a table, but your structure might fall if the surface is bumped. The floor usually is the best place there is -- but not in front of a blowing fan or an open window on a breezy day. • In most cases, each card will lean gently against another. You'll be able to lean cards at a smaller angle as you become practiced in the art of card construction. But remember: Beginners will have a hard time controlling cards placed too close to vertical. • If a card is crooked or isn't standing right, use the end of a spare card to nudge it into place. Big, clumsy fingers are more likely to knock down a bunch of cards than to fix a single one. A spare card also is useful for removing cards if a structure partially collapses. Use it like a shovel: Carefully pick up and scoop the cards off the undamaged part of the building. • The cards in buildings pictured in this book may change from one photo to the next. That's usually because something fell down and had to be rebuilt. In fact, what you see here is probably only two-thirds of what I built for the book. The rest fell down. I'm not perfect; you shouldn't expect to be, either. • Try to sit in a way that's comfortable without leaning on your building surface if it's a table or piece of board. Most of the photos in this book show me reaching in front and progressing away from me as I built. It might be easier for you to build toward yourself. • Take it easy! Have fun! Building will be easier if you have relaxed, steady hands. The structures I'm about to demonstrate aren't perfect or fancy. They're designed to get you comfortable with cards. Don't worry for now about making everything exactly straight or just like the illustrations. We'll get more formal and organized later. Just experiment and learn the basics: the four-card cell that is the seed of life when it comes to card building. Cards ready? Building area ready? Hard hat on? Let's do it. 1. Place the cards within easy reach. Lay the first card on its long edge; hold it upright and don't let go. You'll be building a box of four cards, and it could collapse if you release this card before they're all in place. Use a second card to make a T by gently leaning it perpendicular to the first card. 2. Card 3 makes a second T when its middle is gently leaned against the end of card 2. 3. Complete the box. Lean card 4 against the end of card 3 so the end doesn't quite touch the card in your hand. 4. Carefully lean the card in your hand against card 4 and let go. What you have now should look like a pinwheel, with a square in the middle and a tail extending from each corner. Unbelievably, this is the hardest thing to accomplish in card stacking -- and the root of virtually everything else. If you can conquer these four steps, the rest is a cakewalk. This central "cell" makes card buildings incredibly strong. I routinely build slightly more complex one- or two-story card buildings that support at least five concrete blocks -- more than 150 pounds. Architects often design skyscrapers the same way, with a strong concrete-and-steel core. It supports the floors so exterior walls can be made of lighter materials, such as glass. Now you'll carefully place four cards on top of the box to make a roof. 1. Lay two cards next to each other atop the cell. Don't overlap them. 2. Lay two parallel cards on top, perpendicular to the first two. Again, don't overlap them. The roof should be two cards thick all around. You've finished one "story" of your building. Savor the victory and prepare yourself for the next one -- building a second story. While building on cards instead of carpet may seem tougher, cards are actually the perfect building surface. You'll follow the same steps used to build the first story. 1. Gently place the first card on its edge. You should try to put it in line with the "first-story" card below it, but don't worry too much about that. Hold the card upright and let it "float" between your fingers. You should float this first card any time you're building on a roof. If you grip it, any slight movement will be transmitted to the cards beneath it, possibly damaging the first story. 2. Carefully place card 2 perpendicular to card 1 and lean it in to make a T.
3. Lightly set the third card on its edge in the same way and lean it against the end of card 2. 4. Set the fourth card perpendicular to card 3. 5. Gently lean the card in your hand against card 4 to complete the cell. All that's left is to put on another roof. 1. Lay two parallel cards across the cell. Don't overlap them. 2. Lay two parallel cards on top, perpendicular to the first two. Again, don't overlap them. There's your two-story card building. With enough cards, you can add more stories in the same way until the whole thing implodes. As you get better at it, you'll start merging some steps or taking them a little out of order. Improvisation is the mark of a top card builder. Now let's move on to a few easy buildings that will show how that four-card cell is the foundation that supports everything. None of these buildings should take long once you've mastered the basics, yet they all have pleasing architectural structures and even some decorations. Once again, don't worry about making these look just like the pictures. Yours could be more extensive or less extensive. Just get used to putting up the cards, and don't fret over the occasional collapse. 1. Start again with a basic four-card cell and lay a card perpendicular to one of the tails sticking out from it. Put a card perpendicular to that one, and another card perpendicular to that one for as far as you like, making a kind of crosshatch pattern. Don't worry about making complete cells. The cards will stay standing as long as the four-card cell you started with is there. But take away one card from the cell, and the whole structure will collapse. That shows how the cell is the bulwark that supports everything. 2. Lay a roof over the cell: two pairs of cards layered at right angles to each other. 3. Lay a roof over the herringbone cards. Don't worry about the arrangement; just try to use small overlaps. The roof will help stabilize the structure by holding the cards in place. 4. Put another cell on the first layer, remembering to let the first card float between your fingers. Try to line it up with the cell below, but don't obsess over alignment. 5. Add a crosshatch pattern, as in the first layer, and roof it the same way. 6. Put on a cell for the third story. Roof it with four cards, laid two abreast at right angles. You also could add a steeple for a final touch: Hold three cards on the work surface so that the outer two lean against the center card. Now move the steeple onto the structure and adjust the outer cards so they're balanced against the middle one. You can make this building narrower and taller. The bottom layer of the structure has a cell supporting five cards in a crosshatch, a second layer of a cell and three cards, and a third layer of a cell with a single added card. The last two stories are single cells with a steeple on top. This last structure drops the crosshatch pattern except for one card on the bottom grid. It's topped with five cells and a steeple. Even these quick structures can be strong. Try putting one hand on the top and another under the floors and picking them up as a unit. Your friends won't believe it. I'd have to try a hundred-foot tower to be as mystified now as I was when I built my first record-setter. It wasn't yet an intuitive thing for me to build something fourteen and a half feet tall, topping the previous record of twelve feet, ten inches. The biggest house of cards I'd ever built was around ten feet -- and it was far from perfect. John Franklin, an engineer I was working for in my hometown, heard about that one and learned that the world record was only a couple of feet taller. "What are you waiting for?" he asked. "If you can build ten feet, you can build more than twelve feet." I built a tower in his office that was just under the record. I broke the record several weeks later -- as part of a high school math project. My dad and I set up scaffolding in the school auditorium, and I scavenged an old piece of plywood for the base. I bought a lot of cards and worked a lot of hours to build that silly little tower. I spent four days stacking. (Now I could get it done in one busy day.) I even spent the night as security guard for fear the tower might be sabotaged. The old building's clanking, hissing steam heat made the whole thing a spooky experience. I wasn't sure how much weight the cards would hold, so I doubled or even quadrupled the thickness of cells in the bottom stories -- especially the interior cards. I've since figured out that cards on the edges of each floor are the most vulnerable. Interior cards are braced in both of the directions in which they could fall or bulge. Edges are braced in only one direction. If a tower fails, it's most likely to happen on the perimeter. That tower also was the slimmest of all my record-breakers. Big towers really are just lanky pyramids, rarely more than twelve times as tall as they are wide at the base. That first tower was fourteen feet, six inches tall but only fourteen inches square at the base, so it slightly violated that one-to-twelve ratio. I also used fewer cards in the upper layers for fear their weight would crush the bottom cards. I later decided that that's unnecessary: What difference does it make if it's the ninetieth floor? Since the floors get steadily smaller as the tower gets higher, there are only a few cards in the tallest floors anyway. That first record-setter still seems huge to me, even though I've since built a tower almost twice as tall. It was probably the most risky tower I've built because it was so narrow. I haven't built one that skinny since. Local radio stations and the Spirit Lake weekly newspaper documented the feat. Franklin and my math teacher both measured the tower and signed affidavits for Guinness. Then I knocked it down. When I got the certificate designating me a world record holder, I felt like a rock star -- and I got an A in math.